Stop that leak quickly, effectively, and with minimum cost with our range of specialist coating systems for asbestos roofs, sourced from around the world. Avoid the asbestos removal and disposal cost by waterproofing your building with a new roof, straight over the old one. Perfect for roofs that're beyond coating. Our specialist contractors are armed with the best equipment and expert training for dismantling and disposing of your asbestos roof, as well as years of experience. Protect your employees and family by securely sealing asbestos fibres and enjoy complete peace of mind with an internal coating. Top asbestos roof repair FAQs. Learn more about asbestos roof repair from the experts. 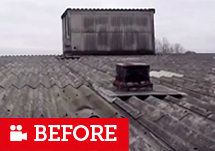 Asbestos roofs were used for a reason, don't fork out on replacement costs unnecessarily. Whatever your asbestos roof challenge, imagine our skills, experience and methods putting things right cost effectively. Whether you entrust us with your repair or go elsewhere, our initial independent advice helps you decide what to do and it’s just a phone call or email away. 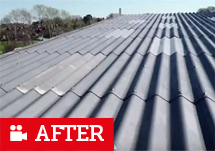 Every day, we help building owners, tenants, facilities managers and surveyors make good decisions about repairing asbestos roofs – and we often go on to do the repairs that give them peace of mind into the future. We specialise in industrial roofing and our contractors do not work on residential asbestos jobs, however, if you require work to be done on a domestic roof or garage we can sell you materials on our sister web site Asbestos Roof Repair Materials. We understand your concerns about solving asbestos roofing problems safely, quickly and cost-effectively, that is why we offer different asbestos roofing repair solutions, depending on your budget and your circumstances. You’ll only discover what’s best for your needs, future plans and budget when we talk. The sooner you contact us, the sooner we can design a bespoke solution to repair your asbestos roof and weatherproof your building. Repair Your Asbestos Roof Now!